For many people, the words “pork” and “salad” don’t really go together. Not for me. When I got to our local burrito place, I always get a salad with their southwestern-inspired pulled pork on top. And by always, I mean whenever they don’t shaft me. A few weeks ago we were getting a quick dinner and I ordered my usual. The way it works out is they get the salad fixins all ready and then add the pork on top at the end. Well, turns out the guy behind the husband (who also ordered the pork) ordered a pork burrito and they gave him the last of it. There was none for my salad. I almost burst into tears. I have no idea if this was a pregnancy related emotional reaction or just my normal response to being porkless (I feel like it’s likely the latter). All I wanted was pork justice, my friends. Simple pork justice. Which is what I bring you today. Perhaps the only way to guarantee that I get pork when and where I want it is to take matters into my own hands. 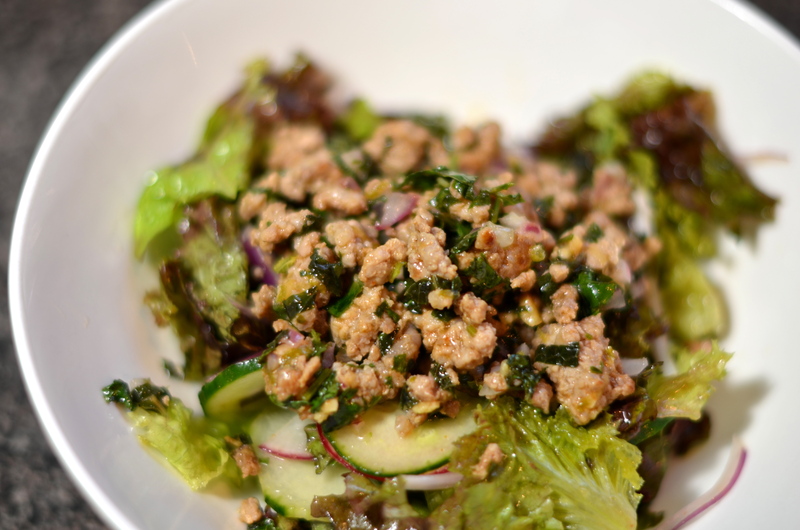 So, I present to you a Thai-inspired pork salad that is a great summertime meal (it’s summer again!). This is adapted from the recipe found in the May issue of Bon Appetit. The first time I made it, I served it as lettuce wraps and used the extra dressing for dipping. This time, we decided to commingle everything. It was easier but less interactive. You decide. You can start off by cooking the pork or making the dressing or chopping the veggies. It’s up to you. For the sake of the ingredient list above, I’ll start with the pork even though that’s not what I did at home. Heat 1 tablespoon of vegetable oil in a skillet over medium high heat. Add the garlic and half of the Sriracha and cook for about a minute. Warning: this will splatter all over you and your kitchen. Be advised. Wear something orange or red when you cook. Better yet, wear an apron. Once your garlic is fragrant and your kitchen reminds you of a Jackson Pollock piece, add the ground pork and cook thoroughly – somewhere in the vicinity of 8-10 minutes will cover it. While that’s cooking, let’s make some other things out of these things. You’re going to end up with two bowls of foodstuffs. 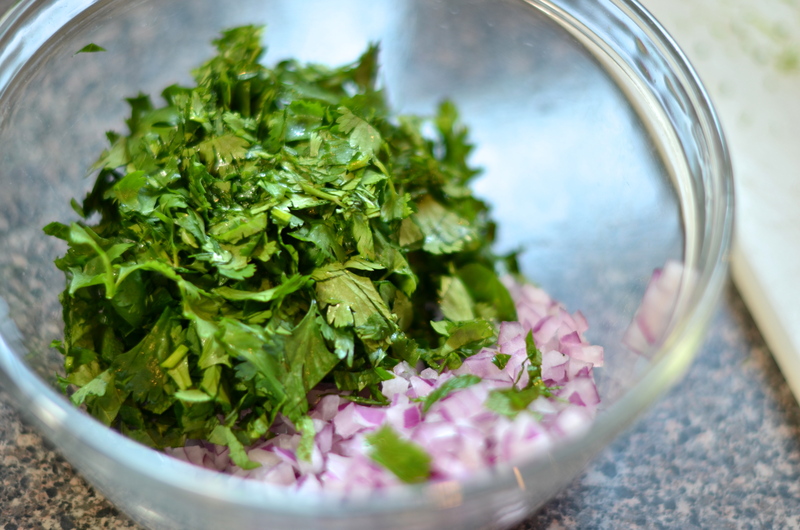 The first will be the cooked pork, chopped onion and chopped herbs. That will be slathered with half of the salad dressing and made to hang out for a bit for all the flavors to merge. The second bowl is the “salad.” It includes lettuce, sliced onion, sliced cucumber, extra herbs if you’re in the mood and a radish or two if you have them sitting around. I love radishes. Go ahead and prep your veggies and get them into their corresponding bowls. Let’s quickly make the dressing. If anyone would have told a younger version of me that not only would I keep things like fish sauce in my pantry as a grown up but that I would like cooking with it, I would have chuckled. But it’s true. Fish sauce isn’t nearly as scary as it sounds. Although, does anyone else picture someone just squeezing and twisting a raw fish until sauce comes out to make it? 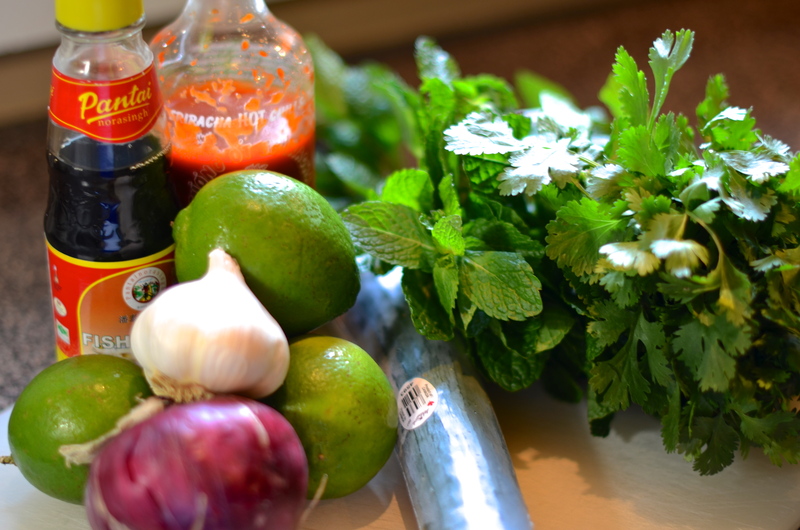 To make the dressing, combine the lime zest, lime juice, aforementioned fish sauce, brown sugar, remaining oil and the other half of the Sriracha in a jar. Shake. 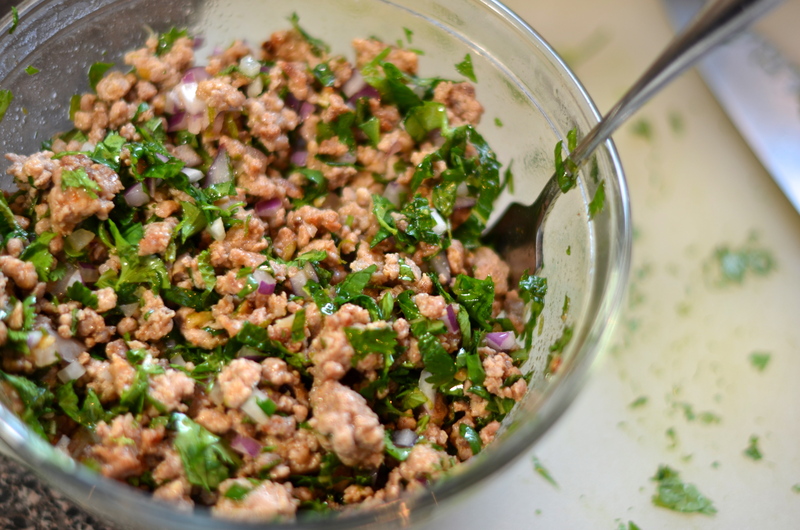 Once the pork has finished cooking, add it to the small bowl with the chopped onion and herbs. Cover with 1/2 the salad dressing and let sit for anywhere from 10 to 90 minutes. I just left it on the counter covered with a paper towel until we were ready to dine. 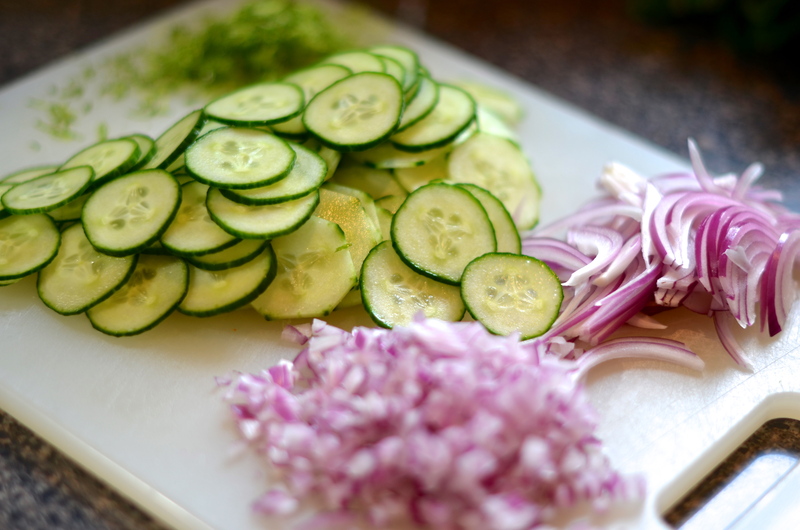 When you’re ready to eat, assemble the lettuce, cucumbers, sliced onion and any other herbs etc. that you decide to put in your salad bowl. Dress using as much or as little of the remaining dressing as you want. I used all of it and I thought it was too much. Hindsight and whatnot. Add the pork on top and serve. The result is a really fresh tasting salad with a bit of heat and a lot of tang from the lime juice. I encourage you to try it. It comes together very quickly and it’s pretty healthy. These aren’t flavors we cook with a lot but I think we might venture east a bit more often. Also, don’t worry about having fish sauce on hand. You’ll use it. I’ll find us some more recipes that call for it just to be sure. May your pork be abundant.